Angry, grey skies loomed over the paddock as qualifying prepared to kick off at stupid o' clock, at least for those of us on the suddenly wrong side of the world. No amount of gin or caffeine can really focus the brain in such extremities, and it's just experience and a savage ability to ignore what's in one's own best interest that allows one to carry on at such times. Green Light!! Vandoorne was first off, tailed by Grosjean and K-Mag, the Williams pair, Sirotkin leading Stroll, followed on, and then it was Ferrari, Raikkonen leading Vettel. Not lots of wasted time as the weather had been highly unpredictable and getting a fast time in under not entirely terrible conditions might wind up paying dividends at the end of the session. McLaren on the Softs due to their, ummm, unusual tyre allocation. Grosjean was first to the top, with a 1:30.504, his teammate 0.2 seconds behind and not bad, considering he lacked information on his rear tyres as he was on his outlap. The wind was vicious, but even more so, was Vettel, going P1 and 0.6 seconds up on Raikkonen. 12 minutes to go, and Hamilton was on it, trying to take the top spot away as the clouds overhead darkened and Mercedes tried to sneak their bankers in ahead of the weather. Job done, Lewis to the top and 0.35 tenths up and adding to the indignity for Ferrari Vettel was off with a spin. Fortunately, Ericsson was immediately off, in a far worse way in Dunlop, trashing the front and the rear and drawing the red flag, along with everyone's attention. In FP3 Vettel had complained of having a pointy front end, and his little pirouette did rather seem to indicate that the team had not entirely solved the problem to Vettel's liking. Renault was the first to the end of the pitlane as the interlude created by Ericsson's off and subsequent red flag ticked to its end. Vandoorne was in the mix with them, on a pair of precious Ultrasfts and both K-Mag and RoGro were out as well, chasing Ocon's time perhaps. and successfully, at least in the case of Grosjean, who wound up P6, ahead of Ricciardo and just a second off the time of Hamilton. In the drop zone at the halfway point were Leclerc, K-Mag, Sainz, Stroll and Ricciardo, with all the work to do as they turned it round to have one final go for the ultimate palmares of Q3. Save, of course, Ricciardo whose engine had grenaded in a rather creative way. Rather disappointingly, the rain rocked in and the runners all began to bail on their efforts. Even that wasn't enough as Leclerc, in P11, had an amazingly tasty spin, catching a bit too much kerb and doing a full loop, before carrying on. 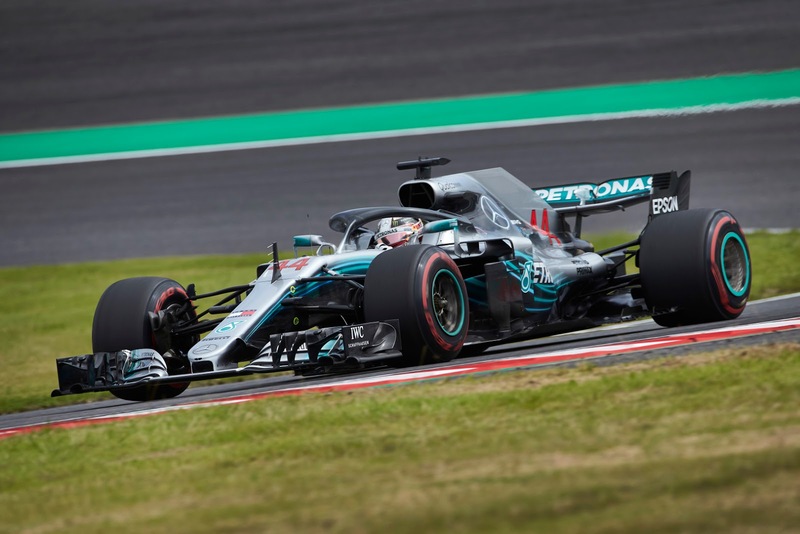 With the weather hindering everyone's efforts, the session was basically done and off in search of some sake went Leclerc, Magnussen, Sainz, Stroll and Ricciardo, as the rest got ready to do battle for the ultimate prize, pole position. A rainbow graced the sky for the start of Q3, surely signifying the fact that BOTH Toro Rosso's had made it through into the rarefied atmosphere of Q3. Hamilton managed to turn the tables on his teammate in the early runs, going 1:27.76 and hanging at the top of the sheets with both Mercedes on the Supers. Ferrari had, rather perplexingly, started the session on Inters, necessitating a swing through pitlane to exchange them for the rather more sensible Supers. Even with the Supers, though, neither Ferrari could come anywhere close, as the window for setting fast times was rapidly evaporating given the increased rainfall. Both Vettel and Raikkonen were caught out, P4 for Raikkonen and a thoroughly disastrous P9 for Vettel as the strategic misery of the Scuderia continued to make itself known. P3 belonged to the Red Bull of Verstappen, which was no doubt as delightfully surprising to him as it was to Horner. Even more rain on its way was the call as the cars returned to the pitlane to get ready for one, final effort, and with drops of rain on the cameras it was the Force Indias out on track, desperately trying to get a lap in before the rain shut it all down. Hamilton bailed on his run as the rain was properly falling, and the weather utterly destroyed Ferrari's effort as well, both Raikkonen and Vettel slithering off the track in lieu of setting anything that resembled a proper time. The fact that Ferrari dithered about on the Intermediates at the start of the session wound up doing them no favors whatsoever and as the checquers flew, it was with Vettel's championship hopes even more firmly shredded. Grosjean topped best of the rest and shocker Hartley just behind him in P6, taking full advantage of the extra running he had to climb ahead of his teammate, a result he absolutely needed, with Marko breathing down his neck.